Researchers at the Hebrew University of Jerusalem (HUJI), Israel, and the University of California, San Francisco (UCSF), have recently identified a gene that gives stem cells the capability to become any cell type. This unique attribute places stem cells at the focus of many studies, since it makes them useful in future medical research. The classical definition of a stem cell requires that it to possess two properties: self-renewal, which is the ability to go through numerous cycles of cell division while maintaining its undifferentiated state, and potency, which is the capacity to differentiate into specialized cell types. In many organisms, stem cells act as a repair system for the body, replenishing specialized cells and maintaining the normal turnover of regenerative organs, such as blood, skin, or intestinal tissues. These features make them exceedingly prominent in medical sciences. 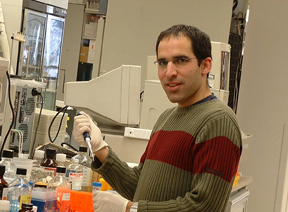 Now, a team led by Dr. Eran Meshorer of the Alexander Silberman Institute of Life Sciences at the Hebrew University (HUJI) and Adi Alajem, a Ph.D. student in his lab, have identified a gene known as Chd1 to be responsible for the stem cell’s ability to develop into specific cells. The academic effort was made along with the UCSF researchers. Embryonic stem (ES) cells are primary cells derived from the early developing embryo. They are capable of maturing according to their environment and conditions, thus developing to any cell type; this is called pluripotency. The common theory held assumes that ES cells have a relatively high degree of open chromatin, enabling their pluripotency. However, this theory requires substantial proof, since evidentiary experiments yielded few results. In addition to the Chd1 gene, the research focused on chromatin, a material found in all cells, composed of DNA. It is surrounded by proteins, which can be found in one of two forms: closed chromatin and open chromatin. The closed state is found when the genetic material is packed densely, preventing the expression of the genes, and the open state is found when chromatin is accessible to the gene expression machinery. According to the study, different cells display varying degrees of open and closed chromatin, depending on the genes that affect their function. The research proved that open chromatin conformation is maintained by Chd1. Moreover, the research enables the expression of a wide variety of genes, leading to proper differentiation – and therefore allowing the creation of all types of specific cells. When the scientists depleted embryonic stem from Chd1, it led to the formation of heterochromatin (closed chromatin), thus preventing the ES cells from generating various types of tissues. The conclusion is that that there’s a proven link between open chromatin in ES cells and their pluripotency. While further studies are needed before pluripotent ES cells could be easily generated, this study marks an important discovery, which could lead to future applications of stem cells. TFOT has covered other stories relating to stem cells, including this illustrative video and the finding of an alternative source for stem cells – hair. Other related TFOT stories include the Prevention of Tumor Growth in Embryonic Stem Cells, also researched at HUJI, and the discovery of a chemical that kills breast cancer stem cells, made at the Broad Institute and Whitehead Institute, Cambridge. For more information about the discovery of Chd1’s importance, see HUJI’s press release.